Head on straight to Mexico to experience the most happening video slot of 2018! It is called Extra Chilli and is developed by the Big Time Gaming. The game is oozed with freebies, multipliers, symbols, and features which collectively help you to win a big time! Extra Chilli is a video slot game which is played between 6 reels. This game is getting popular nowadays in the online casino gaming world. 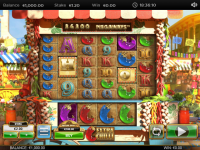 The game resembles a lot to the Bonanza and provides up to 117, 648 amazing ways to win. The only difference which makes Extra Chilli different from Bonanza is the fact that the Extra Chilli has is that the reels have the extensions positioned on the bottom rather than at the top. Further, these extensions would only be activated when the 6 reels present in the slot stop spinning. This adds an element of suspense and mystery to the slot and keeps the game alive. As soon as you start playing and load the game, you are greeted with a captivating page. The Further, unlike Bonanza which required 4 scatters, in Extra Chilli, you require just 3 of them. These scatters are amazing, and if you are able to land extra scatters, you can also get 4 free spins in addition to the additional 8. This was just a quick teaser about the game. There is definitely a lot more to it. In this article, we will explore the Extra Chilli in detail and understand its main features. The lower value symbols consist of A, K, Q, J, 10 and 9. While the higher value symbols include the likes of purple, blue, red and green chillies. A set of fireworks represent the wild symbol which only appears on the lower row. This wild symbol would then substitute the other symbols to form a winning combination. However, this symbol would not work against scatter icons like T, O, and H.
HOT scatters would help you trigger the free spin feature. Basic symbols including an ace, king, J, Q, 10 and 9 would pay 1.75 times your stake amount when you get 6 symbols of the same kind. The symbol which pays the lowest is the 9 as it only pays 0.8 times the original stake for a full line. The premium symbols including the likes of green, blue, purple and red chilli are the most important. Purple chilli pays the most when compared to the rest when you get 6 symbols of a kind. It pays 50 times your stake amount. While playing Extra Chilli, you can actually make an attempt to hit 20,000 times your stake value per spin with the help of multipliers and purple chillies which makes the game interesting. You can trigger free spins with the help of HOT scatter symbols. You just need to land them anywhere in the view and in turn, you would eight free spins along with an additional scatter symbol. Further, you can win four or eight extra spins simply by landing at least three fireworks during this round. Extra Chilli makes use of collapsing reels in which winning combinations disappear and get replaced by other symbols which fall from above. This way more wins can be formed until there are no more winning combinations left. Feature drop amount can be tracked from the right hand side. This amount is proportional to the bet places by you and gets decreased by two coins every time a gold coin lands on the reels. When this feature drop amount reaches zero, the feature gets triggered. The game is pretty similar to Bonanza and the new symbols keep on dropping until there are no more winning combinations left. Focus on three scatters HOT which will help you win 8 free spins, to begin with. Additionally, if you happen to land extra scatter letter, you will get 4 additional spins. All the free spins provide you an expanding multiplier feature. Thus, your multiplier increases by 1 with every consecutive win. You can also look for bowls of chilli under the reels which would add further free spins. As a matter of fact, you can get 4 extra spins for 3 bowls and 8 extra spins for 4 bowls of chilli. Additionally, you can also make use of a gambling wheel that allows you to get free spins, up to 24. It is important to mention here that it could be pretty tough to crack such games. Sometimes, no matter how many times you spin, the results might not come as expected, and in such cases, it is highly recommended to take a break and come back after some time. Further, make sure that you are playing at the best big time gaming slot website which is licensed properly to be sure of fair gaming. The average RTP for Extra Chilli lies between 96.15% and 96.82% depending on the strategy adopted by you while playing. You can attain the higher level by making the best use of features and multipliers. Rest assured, Extra Chilli is an engaging and exciting game with a lot of creativity and at no point in time does the game go dull. Thus, if you are looking for a change and want to explore some unique video slots, you can definitely give the Extra Chilli a try and we are sure that you will not regret your decision.